This is a question that is coming up quite a lot and its easiest to address it here than keep talking about it via phone or email! Manual inspection is obviously the best if you can gain access but obviously if the inspection is out of reach another method is required. With the traditional inspection methods both are fine as a means of reaching the height but can be slow to build in the case of scaffolding or simply quite costly if you are to buy or hire a cherry picker. Even the cherry picker will take some effort and logistics and can take time to setup with the stabilisation feet etc once at site. 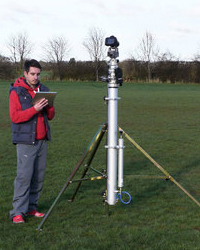 Mast, Drone or Pole Camera? The pros and cons of each. - Needs a large area to setup tripod/base or vehicular access if on trailer. - Increasing number of negative incidents may bring in legislation to further curtail use. - Can only reach the maximum reach height of the pole. Which is the best system for you and how should you choose? Each of the 3 new inspection methods is useful in its own right but we will take each in turn below looking at the usefulness and practicalities of each. Firstly taking fixed masts these are great for high level photography at stately homes or planning a new road but are not really portable enough for inspection work. You often will not be able to set the mast up near enough to the areas you want to look at so we will write that option off to begin with. Drones are a fantastic invention and once the flying is mastered they ideal for many inspections. Depending on the size of the drone we would normally suggest practicing in an open field to start with before you bring it close to any building for obvious reasons but the quad copter style design makes them quite stable even in light winds. What you don't want to do is crash your drone second time out on a roof and have to hire a cherry picker to retrieve it! The main advantage of drones is that they have the ability to get as high as a mast but are also very manoverable / portable at the same time. Some drones come with cameras included and with others your own camera can be attached. For inspections around your own home or similar drones are great but if you wish to use them commercially in the UK (or in most cases around the world) you will need a flying license for it. 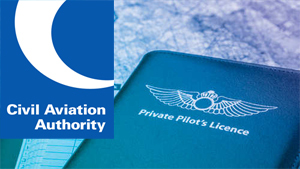 To use a drone commercially (ie for work purposes) legally in the UK you will need a license from the civil aviation authority (CAA). To get this as well as paying the fee you will need to pass a practical flying assessment, demonstrate knowledge of various aviation theory and also set out all the procedures for flights you wish to carry out in your own operations manual. The license also has to be renewed each year. Getting a license is not usually practical for many potential users but can be worthwhile if you have the time and are happy to renew it periodically. 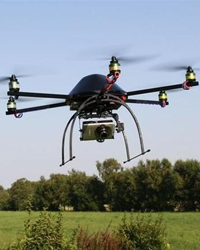 If you want to use a drone for work purposes you'll need a flying license for your drone. 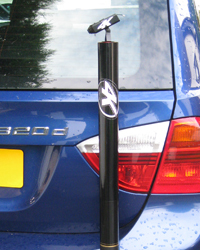 These are really the middle of the road choice as they offer excellent portability with a good height too but without the need for a special license. Certain types of work will not be practical with a pole camera but it is possible to reach up to 3 stories with a system and in the vast majority of cases that will be adequate. Like the mast you are using the camera at the end of the pole but in this case you can walk around with the pole as there is no need for a large heavy base. Therefore you can survey a standard property from the front, sides and rear on foot within a matter of minutes. The pole extends a section at a time so if you only wish to survey a bungalow roof you may choose to use the pole at half length for example. It should be noted that pole camera poles are available in a number of lengths but we often recommend getting the largest you can as that way while you may not always use it at full length the option is there if you need it. The poles are usually very lightweight and are easy to get the hang of with a little bit of practice. They can also be used in windy conditions much easier than drones if you are a little more experienced but be aware that there will be a small bit of flex towards the end of the pole that you need to be aware of. If you have chosen your inspection method now it is time to look at cameras. Photos, Video and Live View. The main thing to bear in mind is that once the camera is pointing at a roof, chimney or whatever else up at height its really useful if you can see what the camera sees on a Live View monitor. Otherwise you may be pointing it at the wrong area! Many cameras now offer a wifi facility for this which will connect upto your mobile phone. Others come as complete systems with their own receiver monitor and dedicated connection between the two. It is important to note here that WIFI works by pairing the camera to your smart phone or tablet. This is usually done manually each time by turning on the cameras wifi signal and then selecting it from your smart device. It will also require a password. Once connected you can use the 'app' recommended for the camera to access the picture on the camera and to take the photos or videos. Its usually pretty easy to do but wifi connections can vary and drop out from time to time requiring a reconnection. Masts do not usually include a camera with them so anything can be used upto and including an SLR. The mast systems are expensive so usually if you have justified this an SLR is what you would go for. We recommend the Canon EOS range and the Canon EOS 7 is our favourite for quality and value. That said for an excellent quality smaller camera the Sony Lens Camera is amazing value as is much lighter than any SLR. Some drones include cameras, such as the Parrot Parrot drone camera. This is a great camera for basic survey work. If you want something higher spec that comes as a package then we highly recommend the DJI Phantom drone. If you are really going for the big time on the large drones again we recommend the Canon EOS SLR with wifi. This is a spectacular camera for the price, is relatively lightweight and is pretty good to control via wifi. 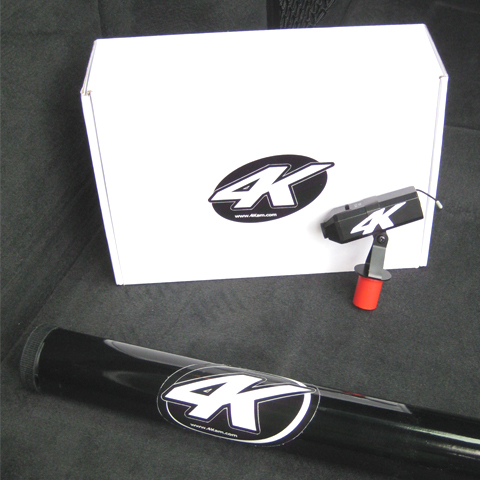 This is the point where I declare a slight bias as we developed the first system for pole cameras many years ago. Originally we built a cable based system but quite soon we switched to a wireless design to as this was so much easier to use when putting the pole up and down. Our latest version - the PK Pro is a wireless camera system with its own dedicated receiver monitor. The connection shows a live picture as soon as the system is turned on and the robust monitor has press buttons for both photo and video. This in our opinion is much better than waiting for a wifi connection then trying to use the touch screen of a smart phone while handling the pole. As both the camera and monitor are included it's a complete system so you don't have to put your expensive smart phone into the mix at all! Its easy to argue the pros and cons of all the products we have mentioned thus far but as we've developed this system for this purpose and we feel its got the edge of most of the other products especially for its ease of use and also the value too. 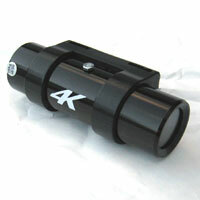 The PK Pro is the base model and ideal for most inspections with its live view, photo and video options. Many teams of surveyors around the country are kitted out with this system using it on a daily basis for reports. High Resolution version for if you need larger higher resolution photos. Like the PK Pro above but can also be used in low light and dark conditions as well such as lofts, tanks or anywhere else without natural light. Also popular with ecologists for bat surveys etc. Firstly to mention our own version! This is a great little wifi camera which can do photo and video and is excellent value especially when purchased with a pole. This is one we recommend to those who need a bigger zoom facility. Our own cameras are prezoomed (ie setup with a lens optimal for survey use) but if you need the ability to zoom further in we don't think you can beat the Sony Lens Camera. If you survey commercial buildings with large roof spans or similar this lightweight camera is easy to use and packs a massive 30 times optical zoom. Remember if you already have a camera or are buying one such as the sony lens camera then you can turn it into a complete system (not including smart phone) by getting a telescopic inspection pole and camera mount from our pole camera accessories page. We hope the above has been helpful. If you'd like ny further info please contact us or sign up below. Leave your details below and we'll send you the latest e-guide to using pole cameras and drones and also info on any discounts that are currently available!